With the Easter holiday right around the corner I have been on the lookout not only for fun crafts but also things I can make on my own. If you are still hopping down that bunny trail and have a child of your own, you may want to check out these ideas. There are many creative “do it yourself” Easter recipes out there and these are just a few of the ones that caught my eye. These homemade carrot snack packs are perfect to put in Easter baskets or as decoration on the children’s table at your Easter dinner. They also are a nice candy substitute if you are trying to cut down your child’s sugar intake! All you need is green curling ribbon, a pack of pastry bags, and your child’s favorite orange snack! The pastry bags can be found at your local craft shop and also Party City stores. You can use anything orange to make your homemade carrots- Cheez Its, Cheetos, Cheese Balls,Cheese Doodles, Gold Fish, and even Orange flavored jelly beans. They are simple to make and very cute to stick out of an Easter basket. Bunny Bait is a sweet treat used to make sure the Easter Bunny doesn’t forget to make his stop at your house this year. Have your children help you make the bunny bait to leave out just for the Easter Bunny. This colorful combination contains popcorn, white chocolate, plain chex mix, broken pretzel pieces, M&M’s, & a few colorful sprinkles. After breaking up the pretzel pieces you place them in a large bowl with the M&M’s, Chex Mix, and popped popcorn. Heat the white chocolate candy coating in the microwave, stirring every 30 seconds, until completely smooth & melted. Drizzle the candy coating over the popcorn mixture and stir to coat. Spread out on a large piece of wax paper and top of with colorful Easter sprinkles. After it cools you can break off the pieces and put them in cute Easter bags to give away. Bunny Smores are a fun spin-off to your typical smore. All you need are a few packages of Easter Bunny peeps, graham crackers, and individually packed Hershey chocolate bars. This is another one that only takes minutes to make and would be really cute to handout to any children you may be having at your Easter get together. Bunny Brownies can be the perfect gift for a friend, neighbor, coworker, or your child’s teacher. Depending on how many you plan to make, you will need glass jars, Easter M&M’s, Marshmellow Peeps, and chocolate brownie mix. The idea is to give them everything they need to make Easter brownies. You can add your own festive Easter ribbon and a homemade tag with instructions. This past weekend the Brio Tuscan Grill near our home had a fun filled event called the “Bunny Brunch.” During the Bunny Breakfast children had the opportunity to color festive pictures, decorate Easter eggs, and have their photo taken with the Easter Bunny. 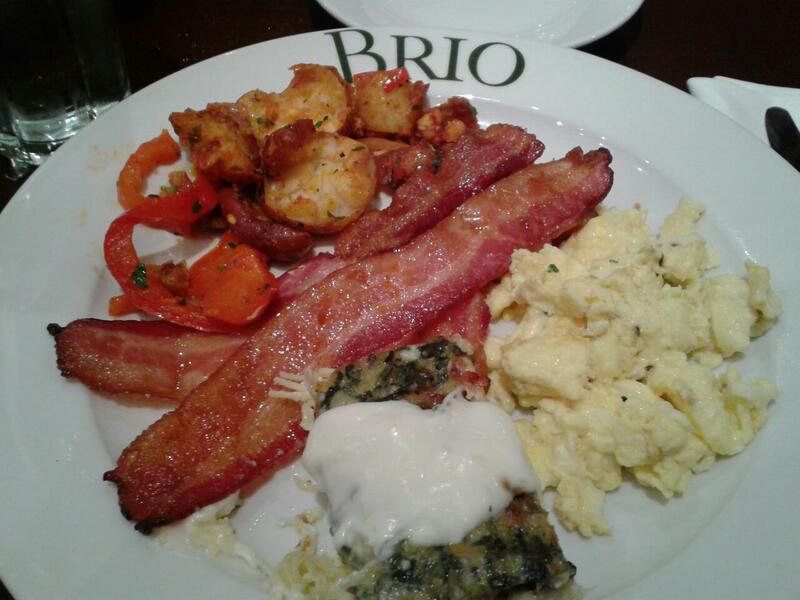 Breakfast included a full buffet of eggs, bacon, seasoned potatoes, french toast, fruit, and a delicious spinach frittata. It was no surprise that Toodie barely touched her plate and wanted to head straight to the room with the coloring tables set up! There were several coloring sheets to choose from and dozens of hard boiled eggs to decorate.She was in heaven. 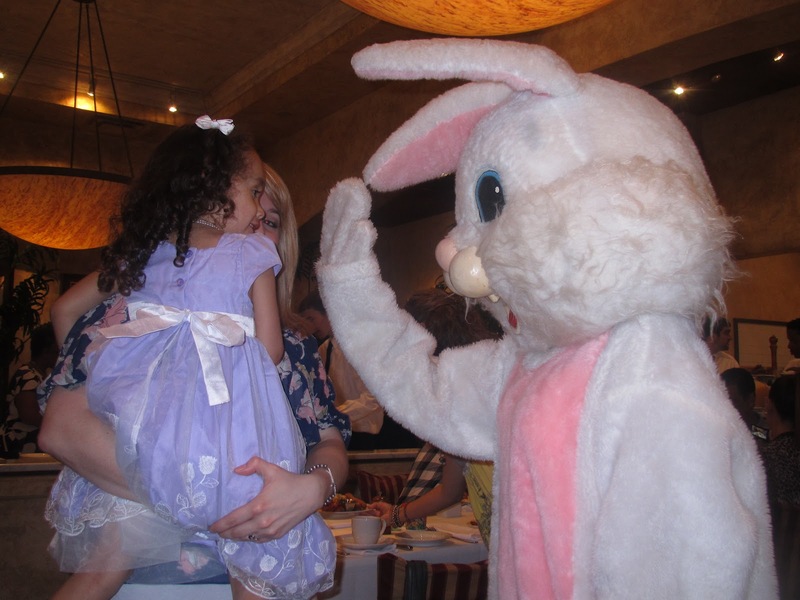 Last but not least she had her meeting with the Easter bunny. I don’t think she even knew what to really make of their encounter considering she just stared for a good 10 minutes. Hopefully this has warmed her up to meet him again at the mall later this week. But I still have a feeling I may end up sitting on the Easter Bunny’s lap with her just like I did with Santa last year! I recently spent some time searching for age appropriate craft kits on Amazon. I was so excited to find the Alex Toys craft sets. The Paper Plate Bugs was the first kit I ordered I was immediately impressed with the quality. Toodie loved choosing which critter she wanted to make and going through the process of creating it. 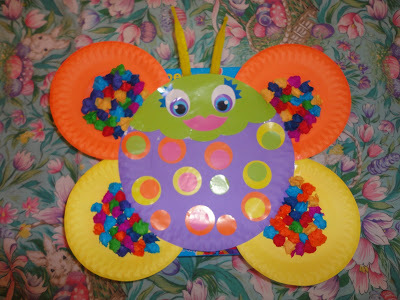 This kit came with everything you need to make 5 colorful bugs out of paper plates. It also included stickers, buttons, googly eyes, pipe cleaners, popsicle sticks, pom poms, paper punch outs, a glue stick, and easy instructions. Each of the bug are packaged individually so you can create one at a time. The only downside that I have found is the glue stuck. The one con is that the adhesive is not strong enough making it hard to keep the project together while you are working on it. If you have a glue gun I suggest using that instead to apply the heavier parts including the smaller paper plates or attachments. Just make sure it is out of site and not in the path of little hands! I found it easier to hot glue everything on before she got started that way I could put it away and not have to worry. This is a wonderful project for one child or two. The great part is that each of their boxes come with individually packaged crafts. If you have a three year old like me than I am sure you know one will keep them busy for quite some time. While today we worked on the Butterfly, there are still three more bugs to make for a later time. One of the best parts is everything you need is in the box so there is no having to run to the craft store to get more supplies. This was a lot of fun and I can’t wait to see what the other kits are like! Hate waiting around for your nail polish to dry? Want to pull your hair out when your freshly painted polish chips? Maybe you just don’t have the time to get a manicure each week and need a quick alternative. All three of the above apply to me and i am sure many other ladies out there. I am a full time stay at home mom and even though i love getting the typical mani & pedi I don’t always have the time to do so. I usually only take the time to give myself a nice manicure if i a know I am going out with friends or on the weekend. Otherwise I don’t even bother. My hands are always in something – changing diapers, painting, play-do, and soapy dishes. If you are like me or just like to change your nails up often then the Kiss Nail Dress Strips have your name all over them! I was really happy to see these in the recent #lovevoxbox from Influenster because I have seen a lot of my friends wearing them lately. To me these are the ideal alternative to getting a manicure or taking the time to give yourself one. The pack comes with 28 strips that vary in size. With so many strips and so many sizes you can use these on your nails or even your toes. After you pick the sizes that will fit your nails you pull the stickers off of the sheet and place them on each nail individually. It’s very important that you press these down very firmly otherwise when you go to file them to remove the excess strip they will pull up. Once they are on your nails you simply pull the extra piece of strip downward and file the edge of your nail with the included file board. After you are done you can clean up the edges with the file or take your nail clippers to remove any edges that might be poking out. Also, if you are someone that tends to be hard on their nails I would suggest using a clear coat of nail polish on top. This will keep the stickers on longer and also give you that “new manicure” finish. Disclaimer- I did receive this product complimentary to test through Influenster’s VoxBox program! One of the first items from my #lovevoxbox that I put to immediate use was the Gillette Venus & Olay Razor. What girl doesn’t need a good razor to shave her legs!? One of the main reasons I jumped to use this razor before anything else was because in a previous box I received one similar. In the very first #voxbox I received from Influenster I had the chance to try the Venus ProSkin which is overall the same concept of the Venus & Olay razor. I had a wonderful experience using the Venus ProSkin so I had a good feeling i was going to be impressed with this one. The main thing that I absolutely love about the Venus razors are the nifty moisture bars. With this razor you have TWO moisture bars that help to lock in moisture while shaving and also keep skin smooth avoiding any dryness. This is one of those razors that come in handy when you have 15 minutes to shower, shave, and get out! With the double moisture bars shaving cream is not necessary. All you need is a little water and you will begin to see the lather. While one bar preps your skin for a close shave the other locks in the moisture keeping the skin soft. Like all of the Venus razors it has a rubbery handle making for an easy grip even in the wet slippery shower. After using the Gillette Venus & Olay razor my legs were silky smooth and most importantly, not irritated. Being very fair I sometimes notice my legs are very red and sensitive after I shower & shave. It’s not fun when you are in a rush looking to wear a dress or even shorts. I often have to wear jeans or leggings until the redness goes now so it’s not noticeable. I did not have to deal with any of this while using this razor. It was very extremely gentle on my legs! The first thing I noticed when I got out of the shower was my legs did not have any red streaks or little bumps from my shave. I never thought the day would come but I think the Gillette Venus & Olay razor will be replacing the ProSkin in my bathroom! 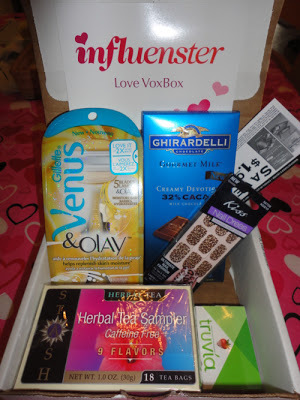 Influenster : Love Vox Box! Here she is! The Influenster Love VoxBox has arrived. As usual this box of goodies did not disappoint. Here is what was in my #lovevoxbox .. If you are not familiar with Influenster or the program you are truly missing out! Influenster gives members the opportunity to test the latest products in exchange for providing your feedback. It also involves you spreading the word and your love for favorite products you may discover! If you are super social and love to try new products while giving your opinion this is perfect for you. Check out Influenster.com for more information & to get started!